It's fun to have visitors. We've just had Chicago and Somerset and Norway for dinner. Limestone Consort had Pennsylvania and CSO (local, but again a visitor) for their last concert. It's intriguing how the differences are so minor these days; the discussion and experiences so shared. 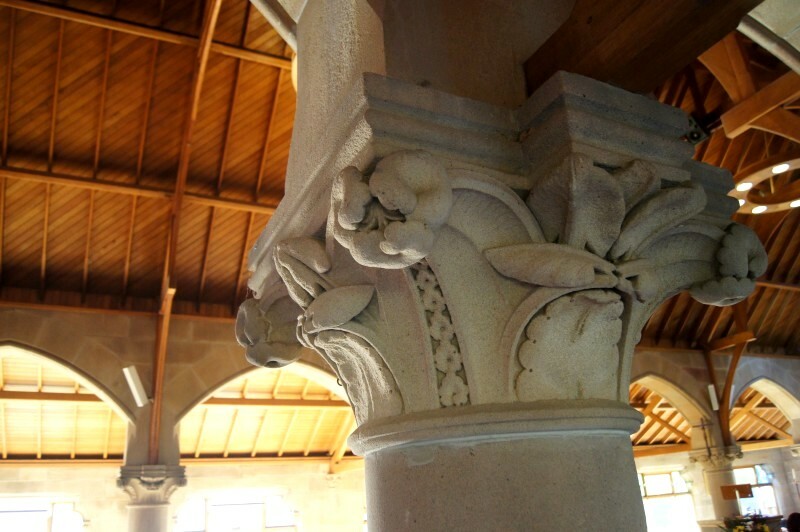 For Limestone, it was JS Bach Cantata 51. So beautiful and so international and even so perfect. They did it justice, too. Limestone were the best ever. This was a stunner. 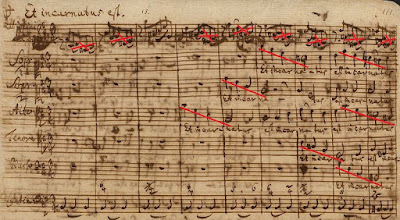 The Bach sang of "Jauchzet gott in allen landen" (Praise ye God in all land). 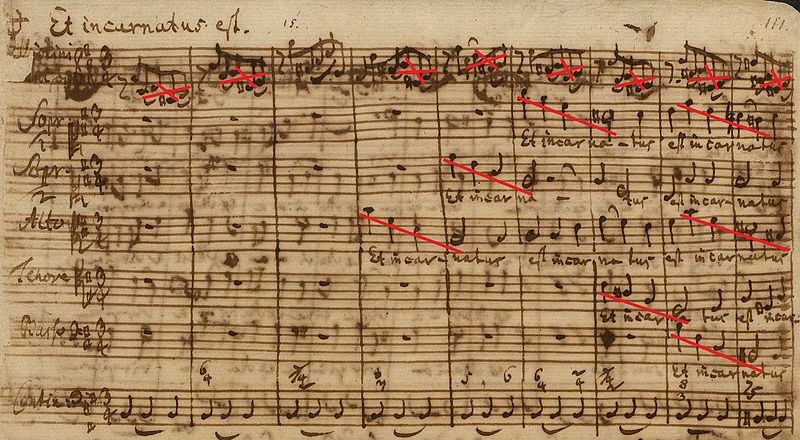 The rolling phrases and the glorying joy that is Bach. Anne Gross is a friend of LC leader and one-time fellow student, Lauren Davis. She sang the soprano part with smiles and blissful joy. How could you not? 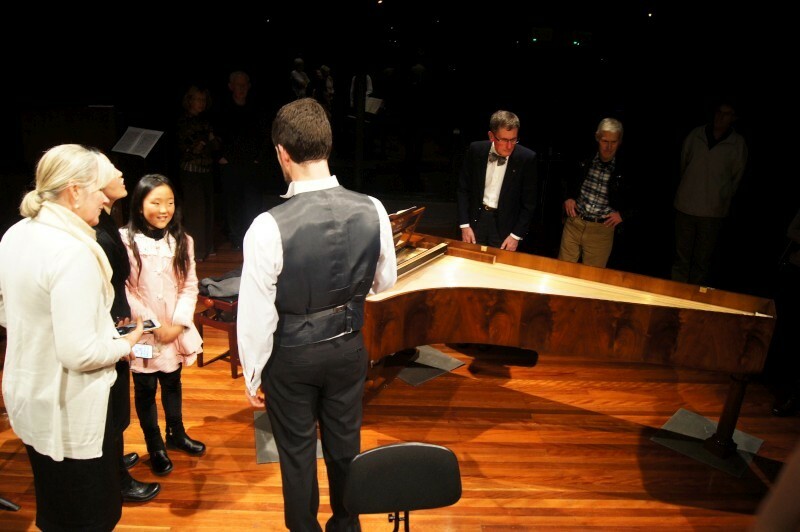 The other visitor was from closer at hand, the Canberra Symphony, but Justin Lingard's piccolo trumpet sang with majestic glory and surprisingly controlled volume. This was a rewarding program, with a lovely string serenade from Kalinnikov (G minor), an Avison Concerto grosso (D minor) and Mendelssohn String symphony no.10 (B minor). All impressive and satisfying. But the work that particularly surprised me was Heinrich Biber's Battaglia à 10 (composed 1673) that used paper under strings to simulate a snare drum rattle, snapped strings for cannon fusillades and a fascinating movement that layered numerous songs to represent soldiers singing before battle. Lauren spoke of modern composers revisiting early periods but this was a composer, 350 years back, predicting the most modern conceits of today's music. Breathtaking! This was a particularly satisfying and challenging concert from Limestone Consort and I can only look forward to more. Limestone Consort comprised Lauren Davis (leader, violin), Alison Giles, Michelle Higgs, Michael Horsley (violins), Hannah Keese, Elysia Fisher (violas), Poppea Dorsam, Clara Teniswood (cellos), Kyle Daniel (bass), James Porteus (chamber organ) with guests Anne Gross (soprano) and Justin Lingard (trumpet). 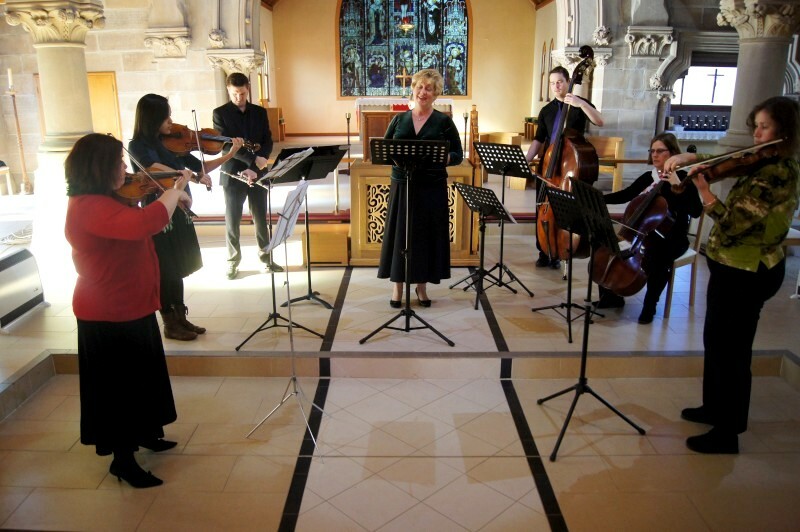 They performed at All Saints Church, Ainslie. 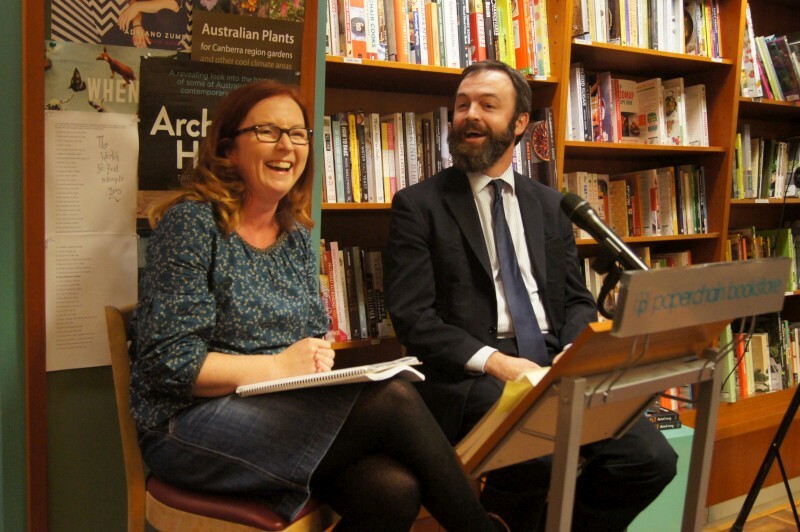 Michael Cooney was the speech-writer for Julia Gillard and he was launching his personal memoir about his time in her office, but the discussion was strangely light on Gillard herself. It seems a common aspect of our recent PM, perhaps as a reserved woman, perhaps as the subject of immense attacks from both sides. 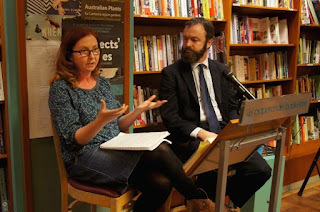 MC was interviewed by Katherine Murphy, the Guardian's Parliament House reporter and, although the numbers weren't large, there were ex- or perhaps current-political staffers in the room. Maybe that's why the talk veered onto life in a PM's office. But early, MC agreed that he was, at least in some way, seeking to elevate the memory of JG and the "pantheon of Labor heroes" was mentioned. He suggested JG bore comparisons to Chifley. Why's this needed? Because she suffered so much attack from Rudd and Abbott, because she had won the 2010 election (which seems to have been forgotten) and because she was actually PM for longer than Whitlam. I was surprised at that last revelation. But it's clear she was more successful than her enemies allowed her to be. Time will tell [when the destruction of carbon pricing will be seen as the dumb and dangerous action that it clearly was and hopefully current proto-police-state legislation - metadata, citizenship and the rest - is removed]. As a role, the PM is different, is treated differently and changes people. MC recounted the story of Mr Rabbit: in the endlessly disrepectful way that JG was treated, she was questioned on her pronunciation of Mr Abbott as if she'd said Mr Rabbit. What??? This to a PM? This in the context of her miserable and even pornographic treatment as a woman? It's demeaning and should turn every woman voter, but it didn't seem to. The life of a political staffer is a "strange existence" too, being both influential, demanding and responsible but self-effacing and without influence or authority. Why did MC do it? He joked because of an "unsuccessful preselection". He recounted a Bondi party of ministerial office staff. He inevitably spoke of the very recent ABC doco, "The Killing Season", saying it was well structured, revealing of personalities, complex but well balanced, although totally on personalities and ignoring the policy. He spoke of the tensions in political offices as between short- and long-term rather than ideologies and the rest. And of JG's shyness but ambition and her great bravery in the context of misogyny and leaks and slogans. Also that her friends were outside politics and that she lacked a "Press Gallery champion". He warned of the heavy demands from the media for the PM's time and compared offices and PR functions in UK and US. There was a short discussion on that early election announcement in 2013. [I always thought that was brave and generous, but noone was giving JG any leeway: she was never going to gain anything from announcing the election date so early and in the end she lost markedly]. There was talk of other revealing political TV, especially Veep (about a fictional US female vice president) and The thick of it (BBC UK). There were some interesting quotes, although here they are out of context: "They bury the eunuchs with the Pharaoh" (political staffers as eunuchs) and "Flight recorder before the crash" (Don Watson, although I missed the context). Also some chat about social media and how it's changing things, making every individual into a minor broadcast celebrity. Finally some thoughts on Rudd's office and Killing Fields as an irresistible opportunity for pollies to work on their legacy. So, Gillard was strangely absent here and perhaps the individual broadcast celebrities of her political office took some limelight. But I haven't worked there, despite being fairly close living here in Canberra and hearing the occasional goss, so it was interesting nonetheless. Michael Cooney (author) was interviewed by Katherine Murphy (Press Gallery journalist) at the Canberra launch of his new book, The Gillard Project : My thousand days of despair and hope, at Paperchain Bookshop in Manuka. I'm bemoaning the dearth of jazz in town these days, but Wayne Kelly has started up a Tuesday evening session at Old Canberra Inn. Free entry; food and drinks available; a jam session each month. It's great to see such a jazz hangout reappear, and with such great local players. 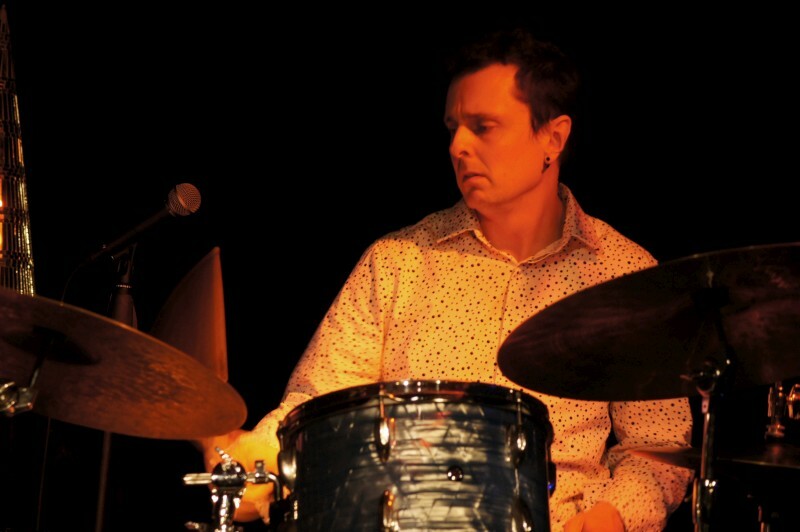 The core band is the reignited Wayne Kelly trio with offsiders Ben O'Loghlin and Mark Sutton. It's a hot and clean trio with plenty of sharp driving solos, some standards singing from Ben, some playful snaps from Mark. It's dark, historical (authentic slab hut construction built 1857, first licensed 1876), comfy and warm in this winter and nicely informal. I caught Wayne's trio playing, then a trio with David Lole and Ben and Mark, then David for some solos, and I got to sit in with Wayne and Mark and David. Great fun and thanks to Ben and the rest. 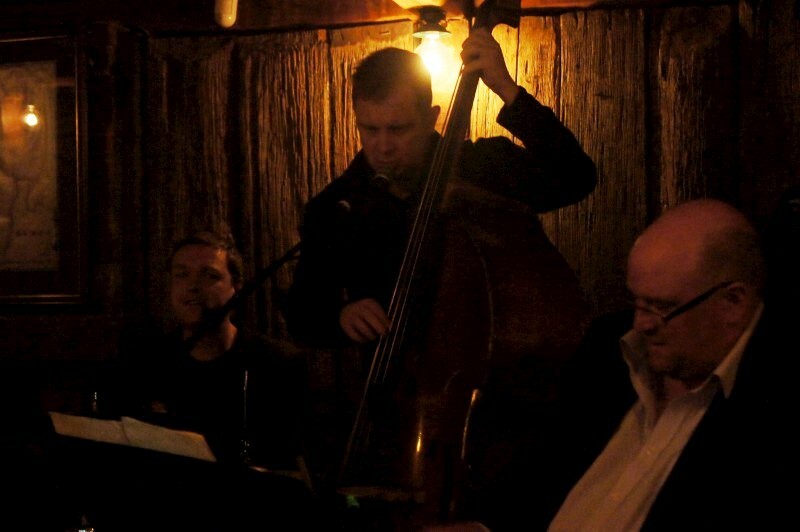 Wayne Kelly (piano) plays weekly 6.30-8.30 Tuesdays with Ben O'Loghlin (bass, vocals) and Mark Sutton (drums) at the Old Canberra Inn. 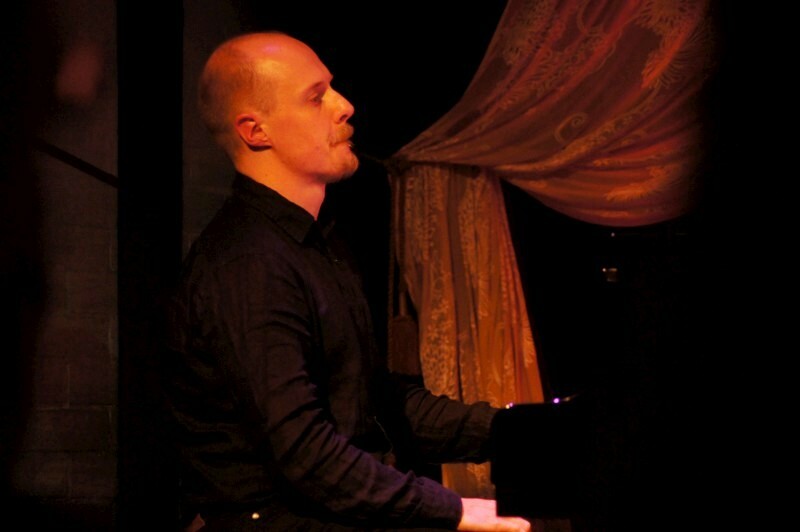 David Lole (piano) and Eric Pozza (bass) sat in. BTW, this has special relevance for CJ. This very trio was the first to get a pic and writeup on CJ in Nov 2005. Monday's harmonies aren't always perfect and sometimes the quicker lines can get bogged down (the semi-quavers in Handel can be a doozy) but when it works it's wonderfully pleasurable for the singers and hopefully for the audience, too. This is Harmonia Monday, my weekly choir, led by two unreasonably good leaders who are seen commonly enough around town in choral circles, Sheila Thompson and Oliver Raymond. And we are singing some seriously satisfying music. This time it was several from each of Handel and JS Bach (from his B Minor mass, no less) and Elgar and several lesser-known others. I'm getting more certain on intervals and the count with more experience, but slips remain too easy. I notice the confidence that comes when someone from a section takes a lead. I'm pleasantly surprised that we hold pitch without piano when we go piano-less. 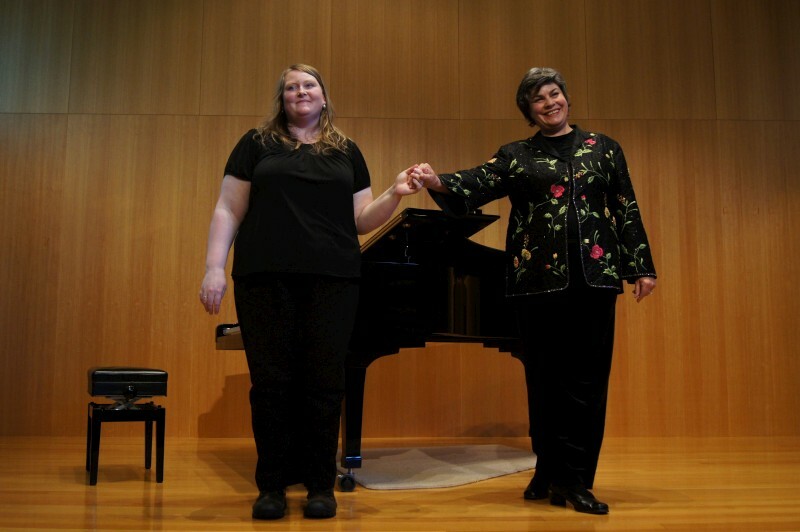 Going free of piano seems to be a worthy challenge in choral circles. 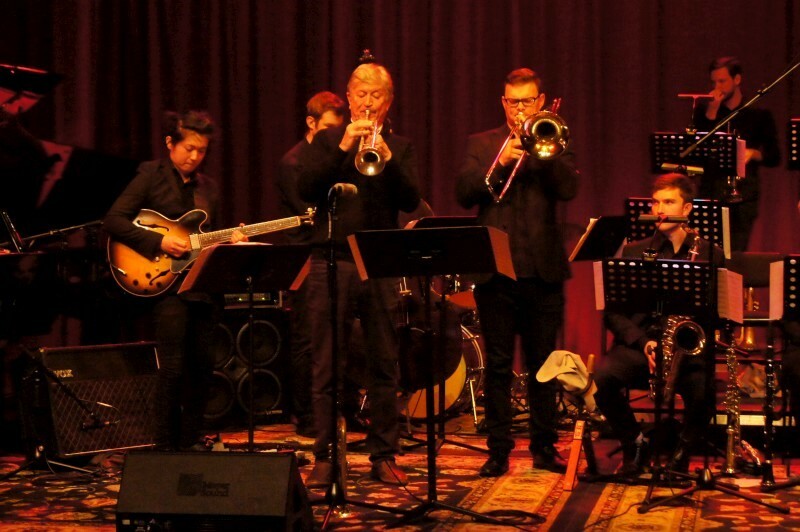 The concert wasn't perfect but the development is satisfying and I was surprised when I attempted some jazz harmonies on a gig and my voice responded decently in pitch and with volume and a satisfying firmness. It's amazing what some practice will do! Much enjoyed and thanks to the choir and leaders and see you all after the break for the next batch of songs to learn. 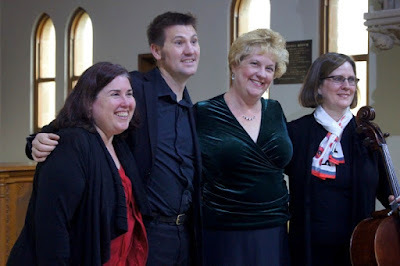 Harmonia Monday choir performed Handel, Elgar, Eriskay love lilt, JS Bach (from the B minor mass), Verdi, Knipper, Wood and Hatton at St Mark's Red Hill under Sheila Thompson (conductor) and Oliver Raymond (conductor). CJBlog is at 1443 posts. That's one post every 2.5 days. Nutty, but it all becomes a habit over time. 1443 posts must be over 1200 gig reports and various other outings, to theatre, museums, public lectures and the like. 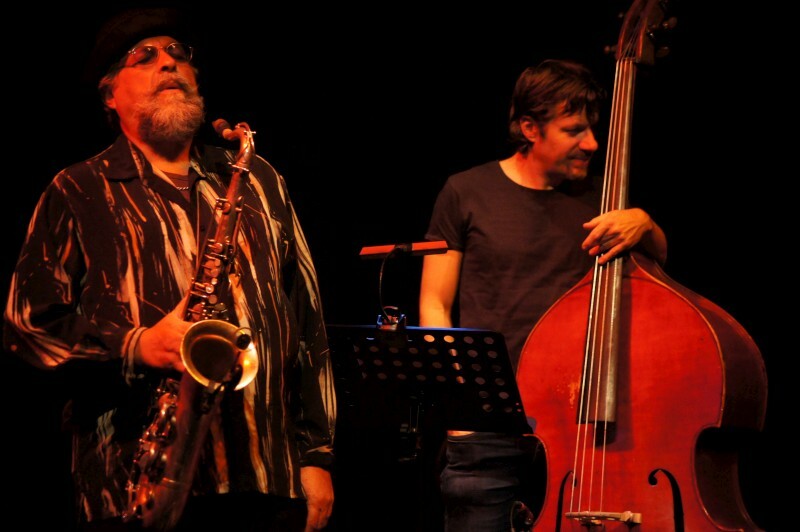 Initially the gigs were jazz, but recently we've seen the demise of any significant jazz activity in Canberra and even of a reliable, regular jazz listening venue. 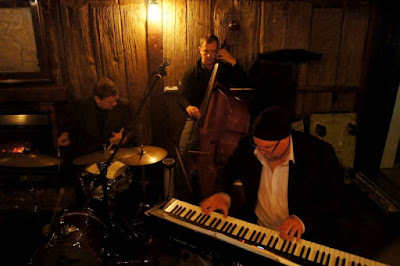 (Amusingly, the first gigs I reported were of the Wayne Kelly Trio - with Mark Sutton and Ben O'Loghlin - and they have started up again weekly following Ben's return to Canberra). Musical interests change and mine have broadened towards the classical and I've found the time for outings with Megan to classical, theatre and more. Public lectures have appeared as Australia's politics have become increasingly distressing and my political leanings have become more evident. The politics I used to record on AginSpin has migrated to CJ. 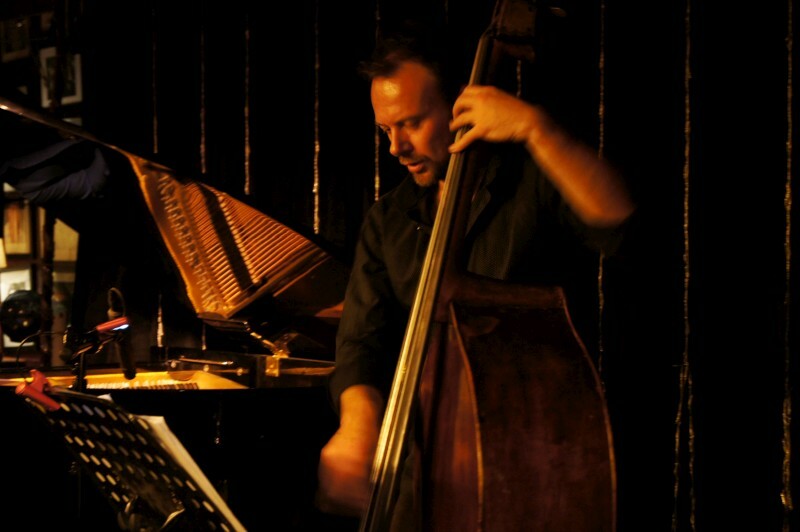 There have been travels and I've amused myself by reporting from jazz clubs around the world. And the changes at the ANU School of Music is the biggest story with the most far-reaching implications. And so on it goes, as long as it goes on. 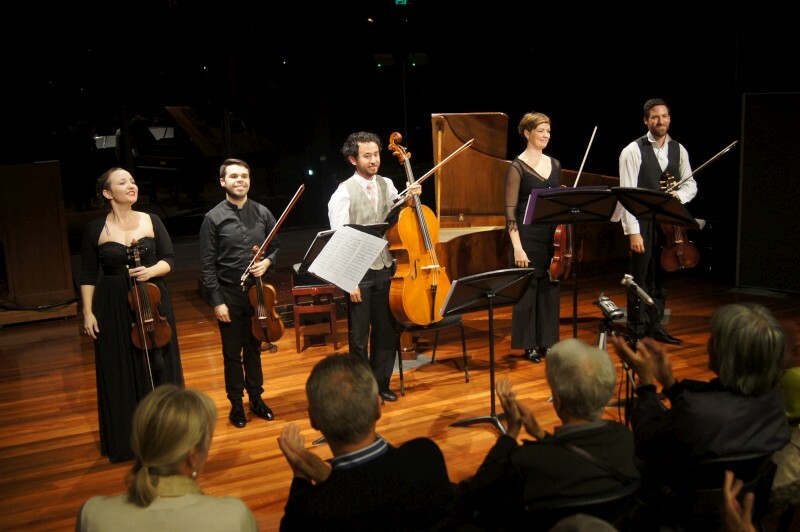 Australian Haydn Ensemble were in town again. They are friends of mine and the music is intimate and personal. The first work was Haydn ... Michael Haydn. They are like this. 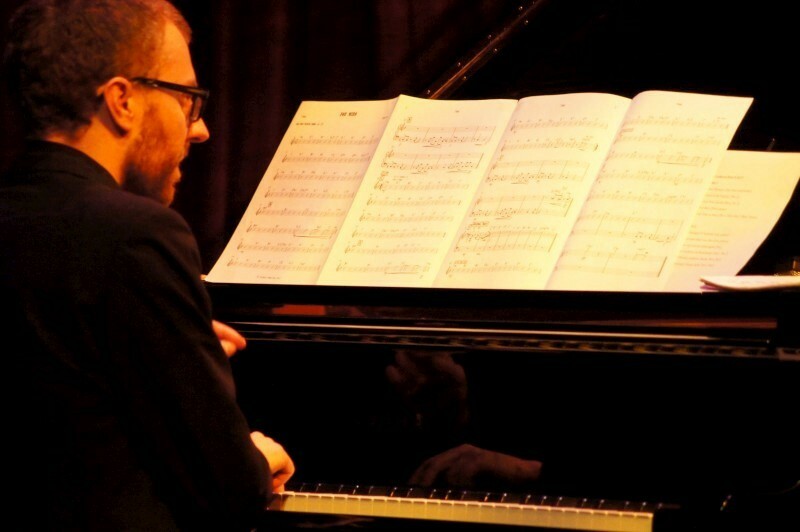 They search the repertoire, develop themes and explore them, expose unusual combinations and relationships. 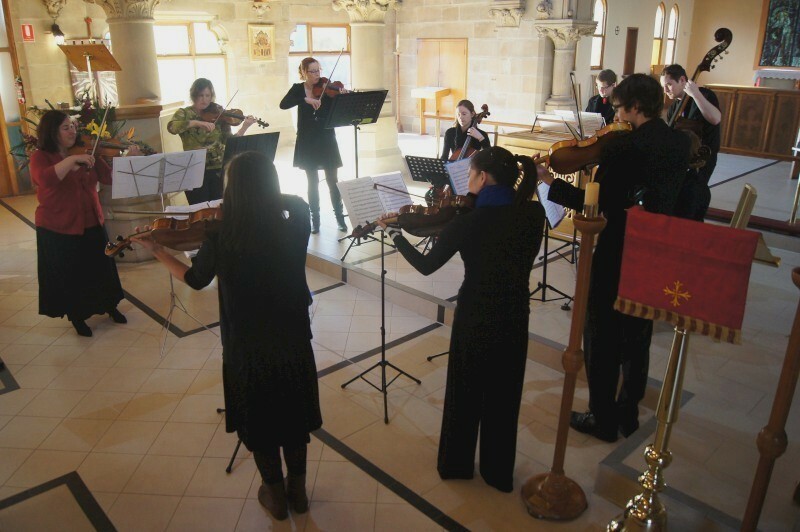 All done on period instruments, so the sound is tender, dignified, often light, perhaps distant from our do-it-quick practicality, perhaps sombre and decorous. Very pretty. Michael H was a dream. The first movement, courtly; the second movement, with viola and violin conversing against sparse cello and pizzicato viola and another violin; then a minuet with passing melodies and rapid violins and viola for the final, fourth movement. Then another Beethoven concerto, this one no.3 in C minor, in a series with Neal Peres da Costa. 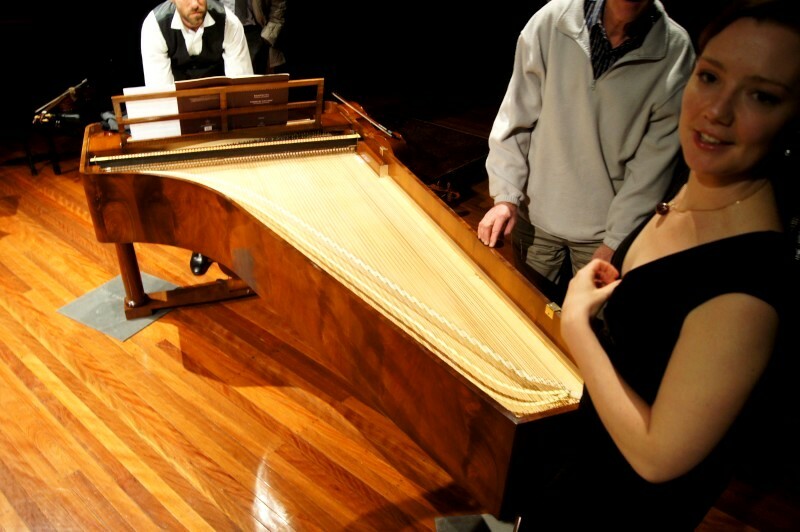 Neal played a copy of an 1819/30 Conrad Graff woodframe piano. This is the style of keyboard that Beethoven would have heard and written for: tiny hammers, leather covered; straight strings, not crossed; lightly toned; flute-like top end, orchestral mid and brassy bass; 5 pedals. So said Neil. The tone was drastically different, of course, as are all these instruments. I heard the keyboard as relatively muffled and softly woody. 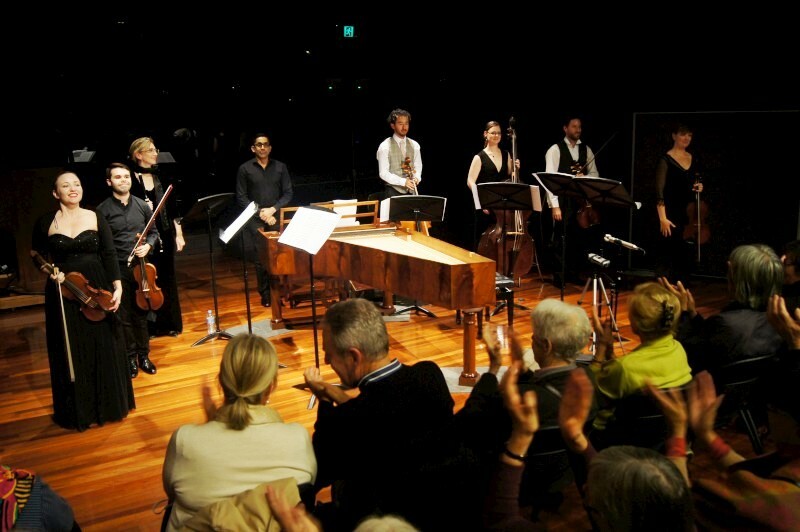 So this was very different from a modern orchestral setting: just a small chamber orchestra and this light keyboard. Delightful. Then Mozart that everyone knows: Symphony no.40 in C minor, K.550. How lovely to feel the immediate affinity to a piece that's known. 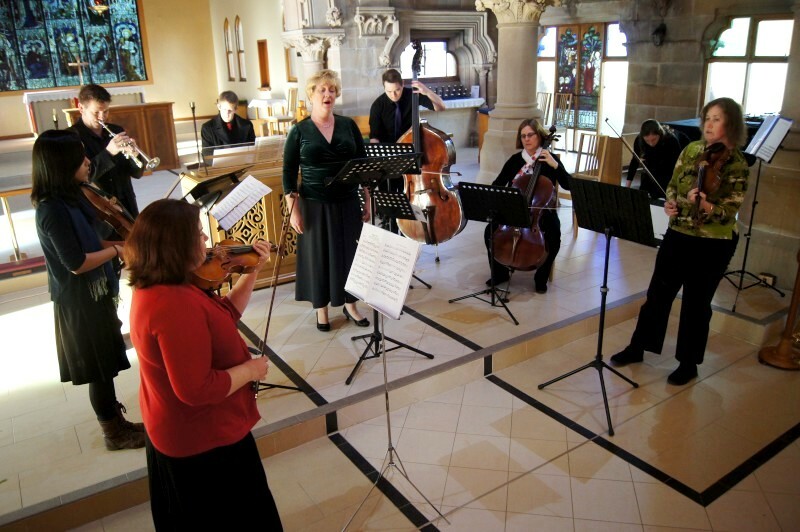 All this in an intimate setting with the familiar tones of a period chamber orchestra. Of course, I followed my mates, especially Jacqueline on her vibrant and wonderfully fluent bass, but then I'm a fan of her bass. So delightful, light but also true. This was another delicious and hugely enjoyed concert. Intimacy is something worth the world in my music. To know the people, to feel the closeness and engage in the chatter afterwards gives purpose and connection and that's such a matter in art, especially in an art as abstract as music. What pleasure to spend another night with AHE. A great joy in my calendar. 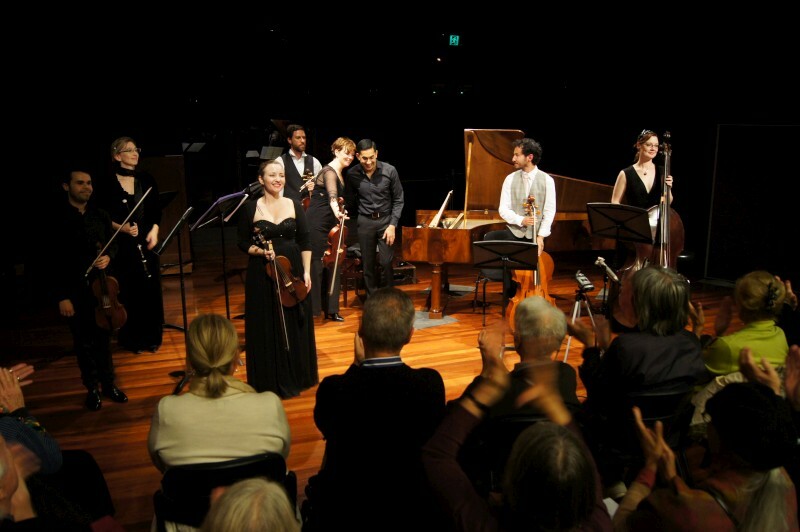 The Australian Haydn Ensemble comprised Skye McIntosh (violin, artistic director), Neal Peres da Costa (guiest fortepiano), Melissa Farrow (flute), Matthew Greco (violin), James Eccles (viola), Health Lloyd (viola), Anton Baba (cello) and Jacqueline Dossor (bass). 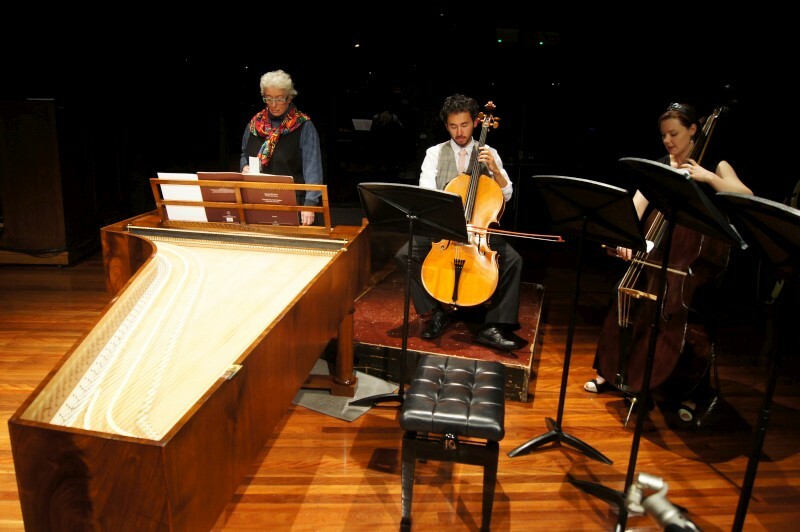 AHE played Michael Haydn, Beethoven and Mozart at the ANU Larry Sitsky Room. It's odd to say that anyone is a favourite economist, but I think it's fair to say that Ross Gittins is just about the favourite economist of virtually everyone I know. But then I'm in Canberra and Ross writes for the Sydney Morning Herald and often the Canberra Times and he's done it for yonks and he's got a heart. The first budget he reported on was 1975 and he's seen 16 elections and 13 governments and 8 PMs since and one budget each year (and various intervening mini-budgets, I guess). We attended his book launch earlier this week. 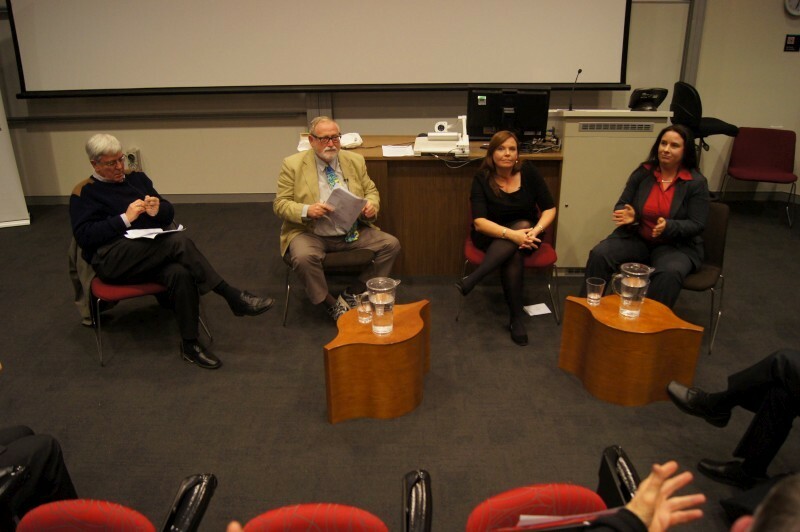 It was preceded by a panel discussion welcomed by Bruce Chapman (ANU), chaired by Marcia Keegan (ACT Economics Society) with Bob Gregory and Sharon Bessel (both ANU). Ross is not an academic, but there's respect here. His family background is Salvation Army, so there's concern for the poor in his blood, but he trained as an accountant, so there's some steel in his discussions. Ross started by denying the similarity of household and national budgets (households don't balance budgets - read mortgages; unlike governments, households don't last forever; households don't have tax or bond powers). So pollies who argue the similarity either don't understand public finances or are telling porkies. Debt is a scary word but sells papers and some can be useful (eg, to deal with a financial crisis). Budgets are not the economy. Bob Gregory argues there is no crisis but it's wise to talk of reducing debt, although he's not expecting a budget surplus within a decade. Why? Libs are committed to tax reduction, won't consider reduced deductions but the public won't come to it and no Australian government has ever reduced taxes (just used bracket creep to hide increases) but inflation is and creep is now low. The Intergenerational Review (IGR) could have been useful but was politicised so lost potency. Sharon Bessell is a political scientist, not economist, so spoke of debt-narratives, poor policy development due to these narratives, narratives as "form[s] fundamentalism[s]" leading to a harsher society, narrowed scope for good policy and lost visions for the future. This is despite institutions like the Parliamentary Budget Office with its independent advice on super and pensions and tax expenditures and the like. There was talk in questions and otherwise of hysteria from IPA and others; predictable thinktank and lobbyist agendas; case-by-case justification for private ownership, eg, of infrastructure; threats to credit ratings and its cost (and the inability of these very credit ratings agencies to properly rate many products before the GFC); the possibility of crisis leading to good policy outcomes (eg, Keating's banana republic [and for that matter, Rudd/Swan's GFC response); definitions for capital investment (in response to a suggestion of health and education as just that); US Republicans and Democrats as a guide to Australian politics (I shudder at this thought although I've thought the very same thing and dreaded it); that the last budget was "nothing to do with debt and deficit", "these guys are so unimaginative..."; who sets the debate and the arguments of self-interest; the $80b removed by Libs from state budgets for education and health. There was more. Nothing at all unexpected if you know your current affairs, but a tragedy none-the-less. 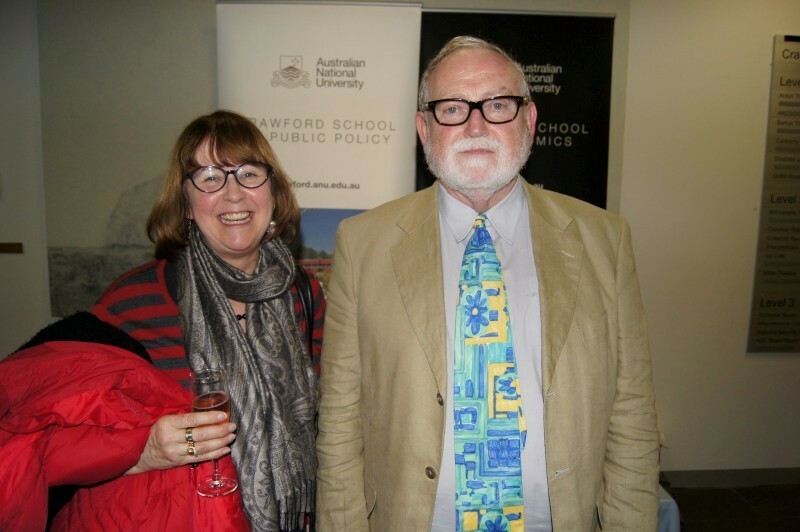 Ross Gittins spoke with Bob Gregory, Sharon Bessel and Marcia Keegan at the Crawford School of Public Policy, ANU. Bruce Chapman provided the welcome. 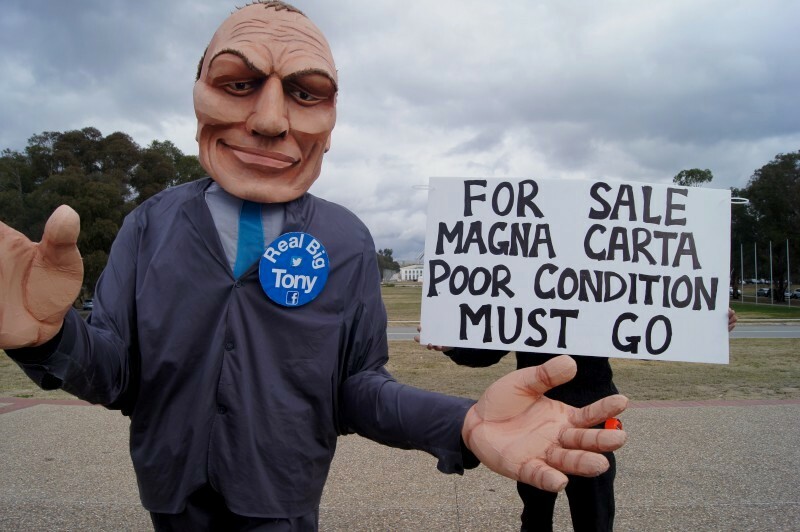 BTW, I include a pic of Real Big Tony entertaining the waiting, madding crowd lining up for Gillian Triggs' talk on the 800th anniversary of the signing of the Magna Carta. Outside Old Parliament House. We didn't get in but a transcript is available online. After the excitement of the visiting internationals at the Street Theatre recently, there was just one small resurgence before the drought, but it was a goodie. Reuben Bradley visited on the last night of his tour to launch a new album. The theme was intriguing, even if I am not a reader of much fiction of imagination: a dedication to horror fiction author, HP Lovecraft. 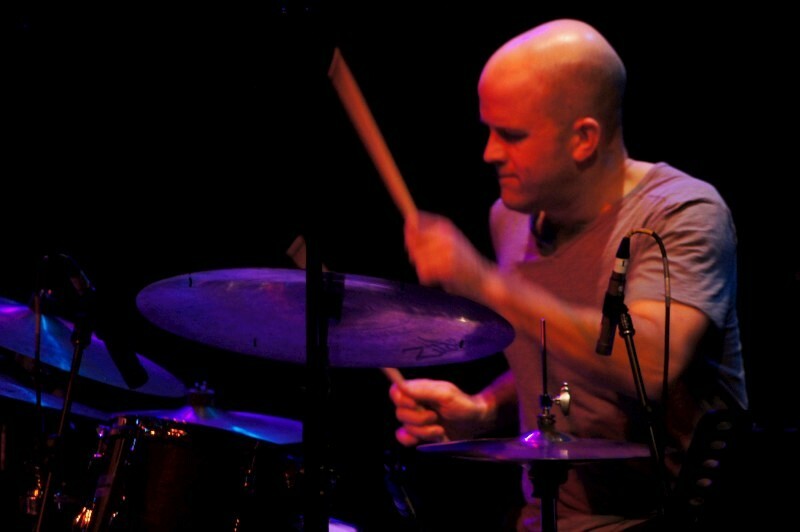 The trio was excellent: Brett Hirst and NYC-based Taylor Eigsti, returning just a few weeks after appearing with Eric Harland at the Capital Jazz Fest. What a treat. Every one of the players performed with great chops and seriously interesting exploration. 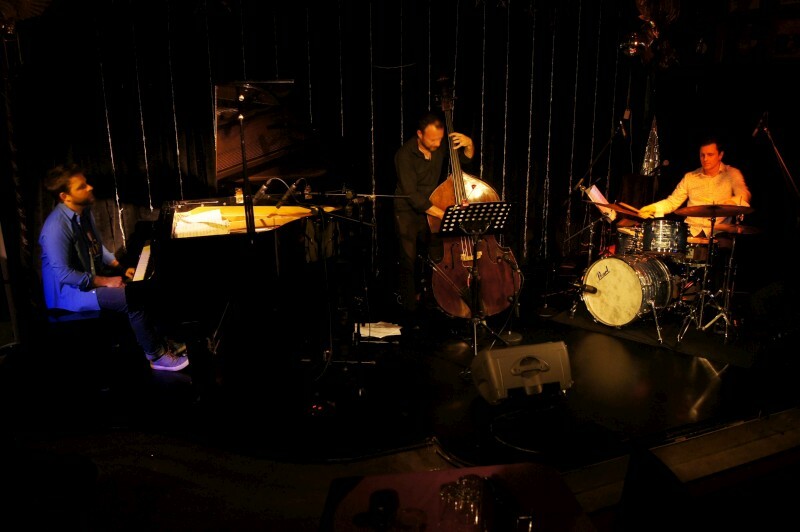 The music was moving, driving, sometimes floating; complex and convincing contemporary jazz. They were to play at Smiths, but alas. 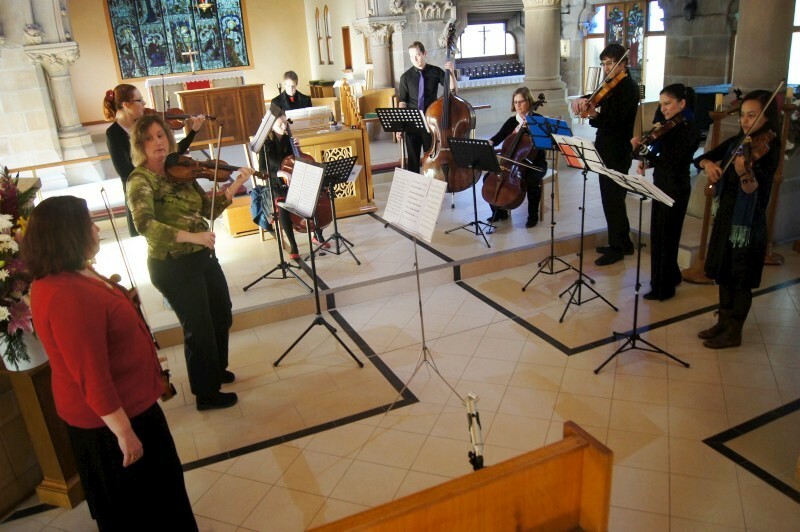 They did play at Vivaldi and it was a wonderful venue. Too poorly attended, despite the frequent announcements by Reuben. What a gig was missed. 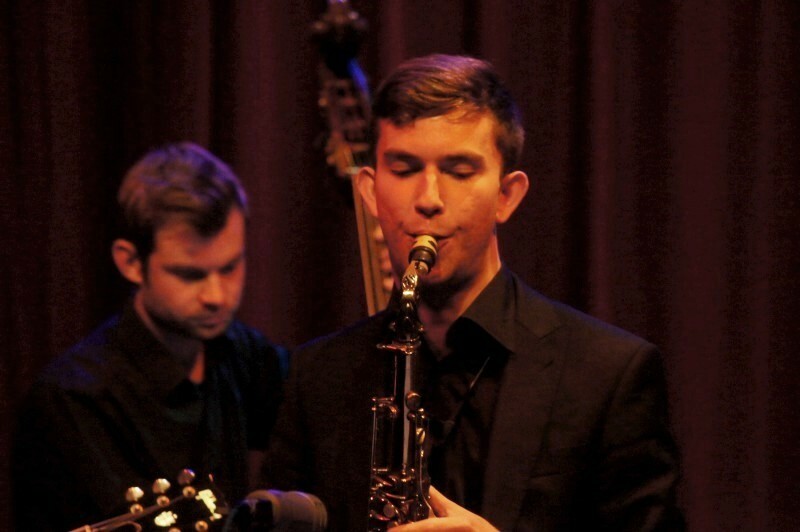 Taylor's jazz lines just floored me; consistent, expressive, inventive but easy and unforced. His ease of four note snippets had me thinking McCoy Tyner but he's a magpie. 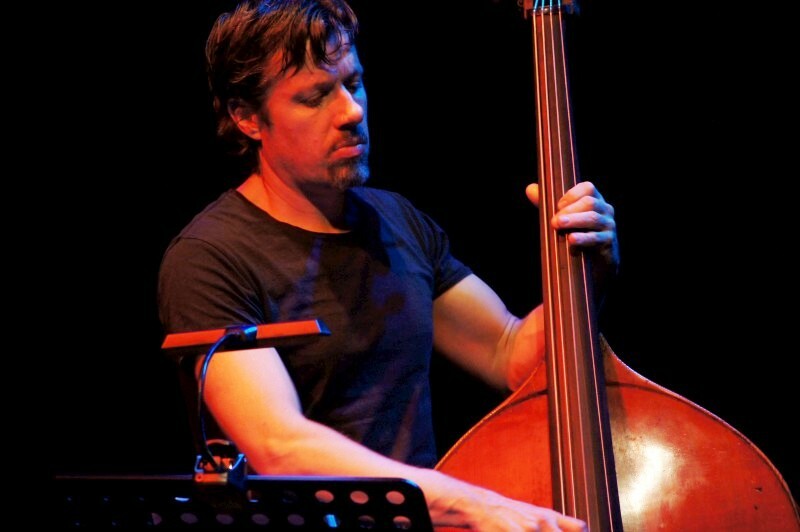 Brett's solos were so well spoken, nicely intervallic or scalar and always compelling. Reuben was leading, busy, pushing the beat, full of colour and movement and often expressing it all openly on his face. I fear we are entering the winter of our jazz-discontent here in once rich Canberra. Thank the gods for the Gods. Otherwise, save your dollars for NYC. The frosts are setting, in Canberra, in jazz and more. But this was a great concert and hugely enjoyed while it lasted. Reuben Bradley (drums, compositions) played at Vivaldi to launch his new album, Cthulhu rising, dedicated to horror fiction author, HP Lovecraft. 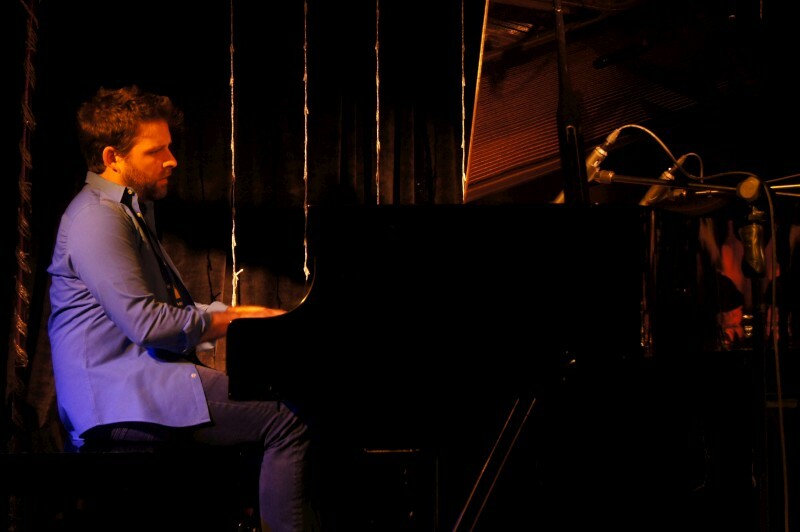 Brett Hirst (bass) and Taylor Eigsti (piano) accompanied. 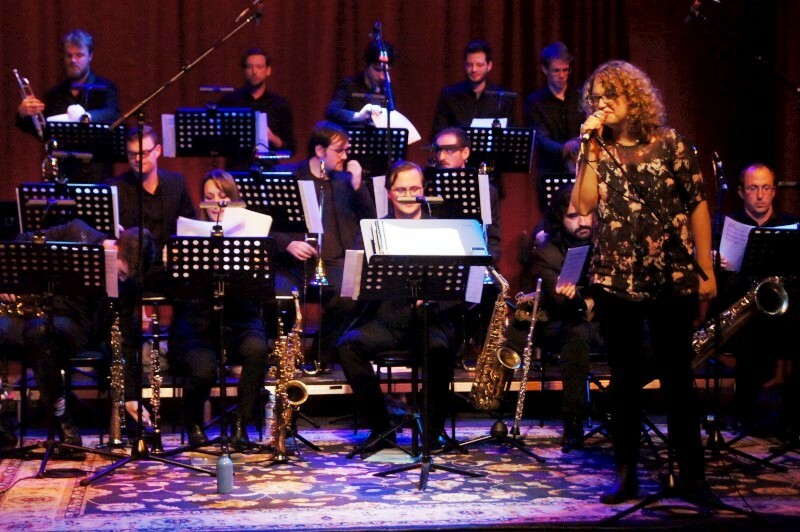 This was cool: a meeting of jazz and opera. Sally Greenaway on piano and Louise Page on soprano voice. It had a nifty title, too: Tin Pan Sally. 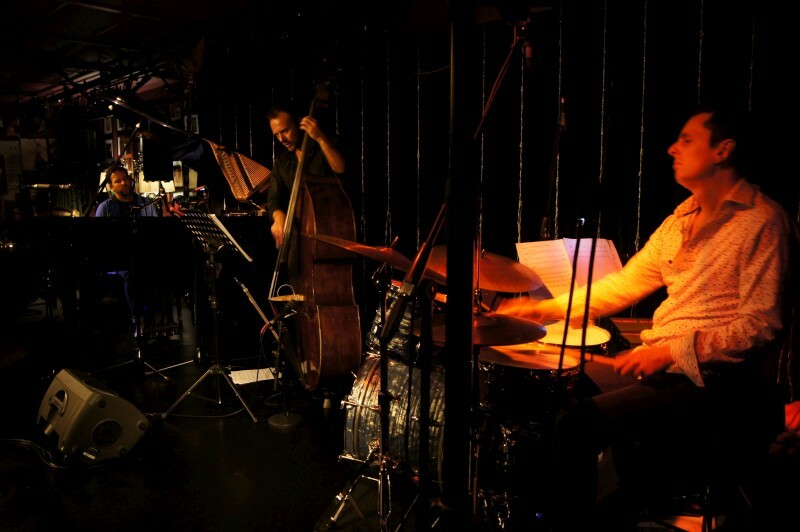 They had performed at Merimbula Jazz Festival and Louise commented on the good time and the chance to be cool. It's a crossover; a different world. Louise also observed that the backing changes every time, but she dealt with it perfectly well. Jazz is like that. Sally displayed a chart and explained it's reharmonised and then improvised with substitutions and the like on the day. This was maybe new for a Wesley audience, but it all went down a treat. I loved the songs - Gershwin, Kern and the like - but I usually hear them as instrumentals. The words can be twee, but they can take on a strange romantic authenticity with the music and Sally and Louise got this. I particularly loved their takes on The man I love and Over the rainbow. Such attractive melodies, such trivial lyrics, but what a joy combined! Sally did a 5/4 instrumental take on Charlie Chaplin's fabulous Smile. I enjoyed hearing the seldom performed verses for several of these tunes (jazzers usually just play the AABA-or-other refrain). Even the term Verse as the introductory material was new to me. Thanks for that, Sally. Then Sally talked of merging two songs and proceeded to demonstrate with an enhanced My funny valentine as encore ("It's think it's quite fun ... hold on"). I guess this mix would have discombobulated both Merimbula and Wesley but they probably all enjoyed it immensely, just like I did. What a wonderful little romantic musical mutiny! Sally Greenaway (piano) accompanied Louise Page (soprano vocals) at Wesley singing songs from Tin Pan Alley. Martin Ravallion returned to ANU for a public lecture. He's now a professor at Georgetown University and has been Director of the World Bank's research department. He was speaking at the ANU Crawford School of Public Policy. All indicative of a worthy and informed discussion on the topic, Global inequality : are the world's poor being left behind. It was certainly worthy, even important, but not quite what we expected. MR considered traditional assessments of poverty that show major reductions in the number of people below the poverty line in developing countries. The statistical technique is the Counting approach but this aggregates and misses the poor who remain at the poverty line. MR has developed (very recently, it seems, so this lecture was significant) an alternative approach that he called a Rawlsian approach and that measures whether the consumption floor is rising, so the poorest are rising. This is absolute, not relative, inequality. He quoted Ban Ki-Moon and Gandhi's talisman and IFRI and ILO which also highlight the poorest, and he observed that economists consistently utilise and perhaps see no issue with the more averaged counting method. He's now matching his approach against relevant data for countries to further investigate its effectiveness. And here is the approach (if I copied correctly): probability of number at or near the consumption floor is expressed by E(ymin/y) where (?) y(1*-SPG/PG). As I said, not your average public lecture. The questions were a mix of academic and public and perhaps expanded on the real socio-political implications. There's a biological floor where the poorest die, but this is not the consumption floor in most countries, including developing countries. The poverty level in China has recently been raised from $US1pd to $US2pd; the poverty level in USA is $US13pd; the international poverty level was determined in 2015 as $US1.25pd. 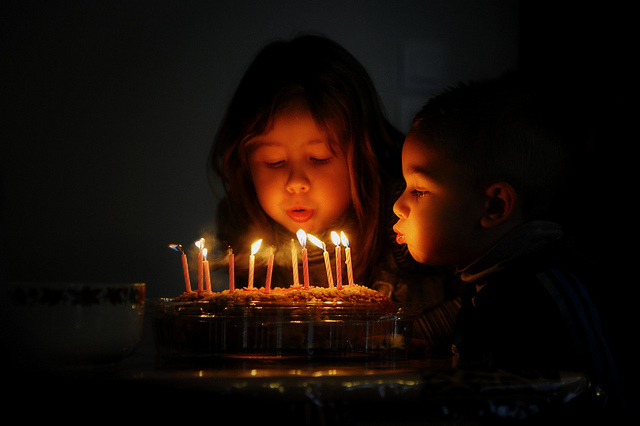 All this is not a function of capitalism but of the effectiveness of social policy through social safety net schemes, although approaches to these may coincide in different countries. Social safety nets are increasingly widespread, including in developing countries, but often don't raise the consumption level of the very poorest. The role of colonialism is significant but often exaggerated. Foreign aid can be workfair (?) programs or cash transfers and the better option is not obvious and depends on circumstances. I guess his final message would be: don't focus on the floor alone, but don't ignore it. So, more mathematical, more theoretical, more narrowly focussed than most public lectures, but worthy and informative. 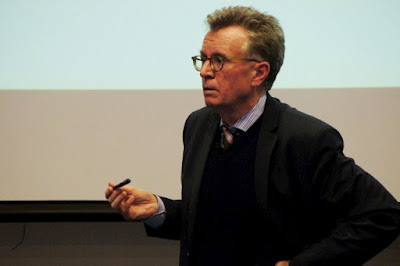 Dr Martin Ravallion spoke at the ANU on global inequality. 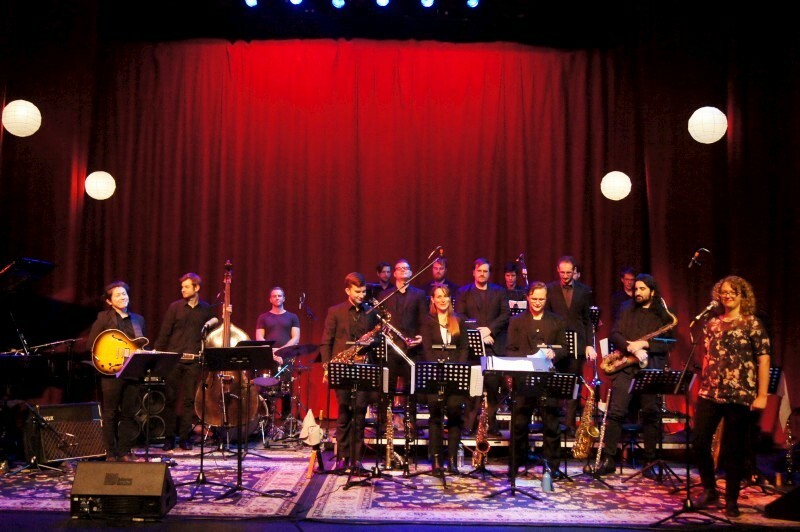 Jenna Cave returned to Canberra with her Divergence Jazz Orchestra for the final concert of the Capital Jazz Project. 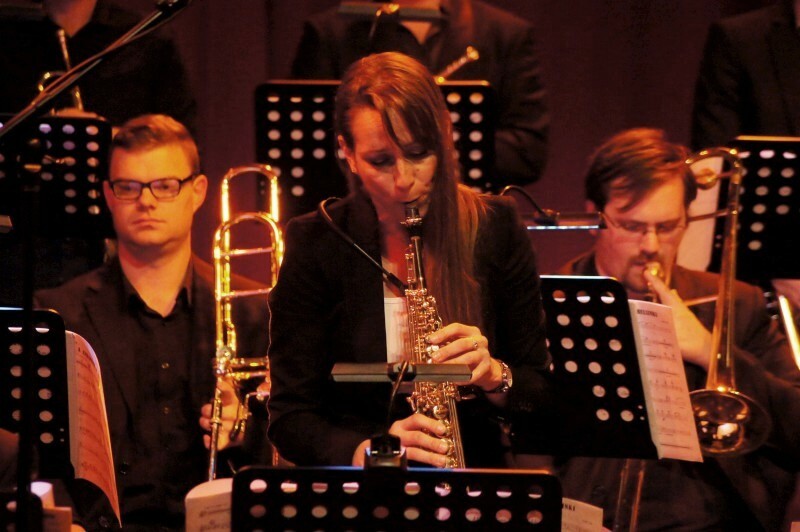 Jenna was Canberra-bred and a student at ANU a few years back and this was her first return with her big band. Big bands are not easy to travel but what a sound they have! 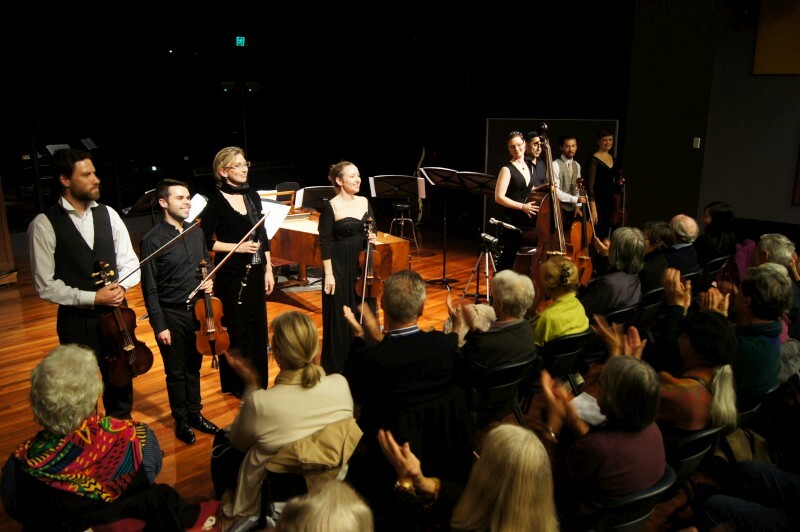 DJO plays the music of Jenna and other Australian composers. 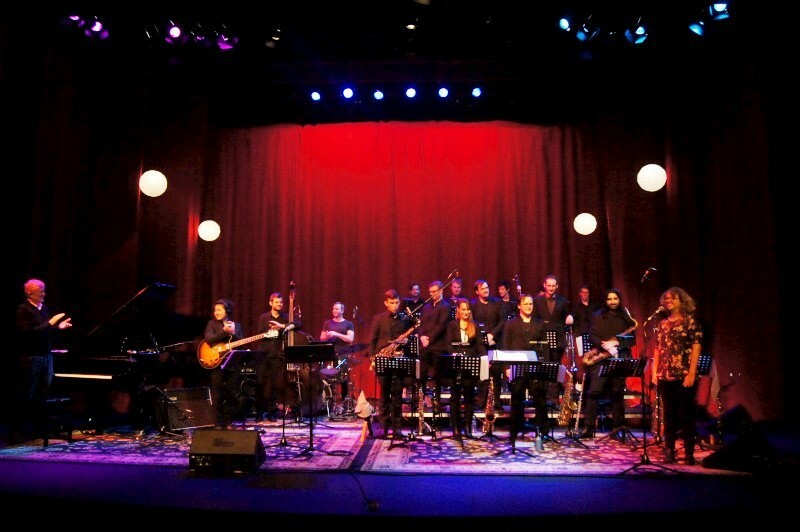 This concert was a Jenna feature: all her own arrangements, mostly her own compositions. What a nice band! Plenty of dynamics, nice intonation and feel, plenty of decent solos. 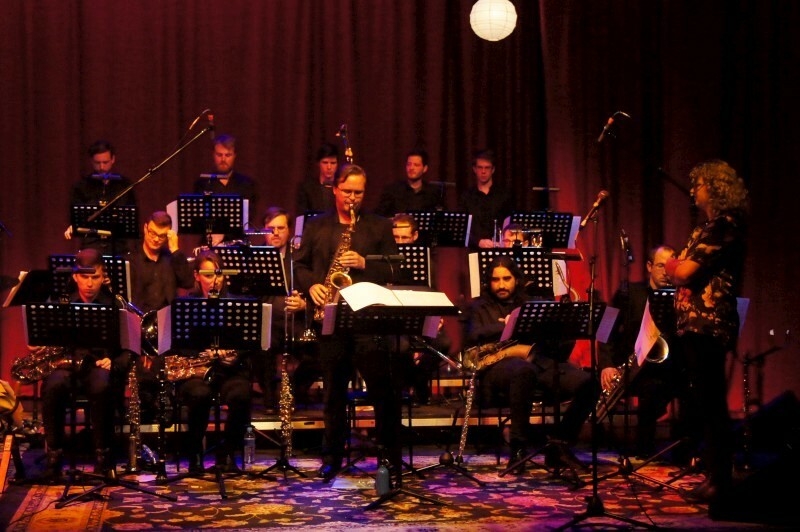 There were several tunes inspired by African rhythms, some tunes I'd heard before when Jenna was writing for student bands, a commission for WAJO (West Australian Jazz Orchestra) in 7, several with the feel of New Orleans recalling her trip there with a few muso mates. 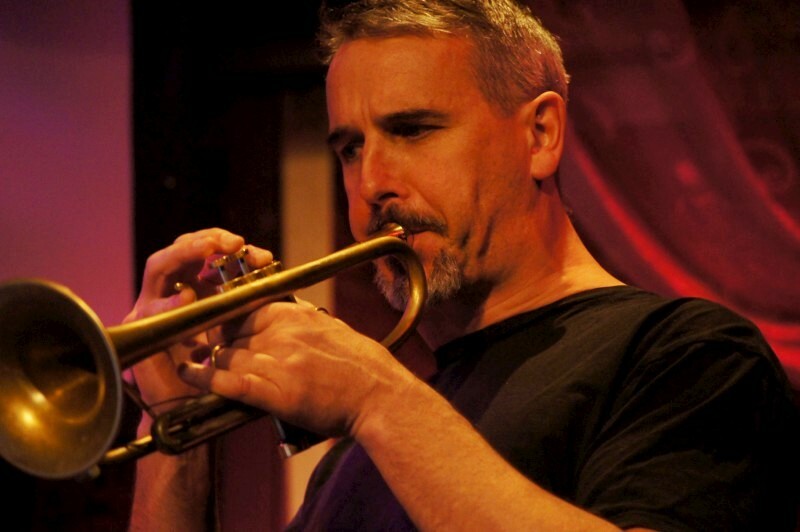 One was Jazz euphoria on Frenchman's Street and that rang a bell: I've also experienced the music in every shopfront on night-time Frenchman's Street. Another channeled the infectious rhythms of the NOLA brass bands. There were some more pensive charts, for a renewed sense of optimism, or dedicated to a friend on an early death. For Miro was a Basie swing chart inspired by her studies of Sam Nestico. And an arrangement of Miro's rollicking composition, For Woody. 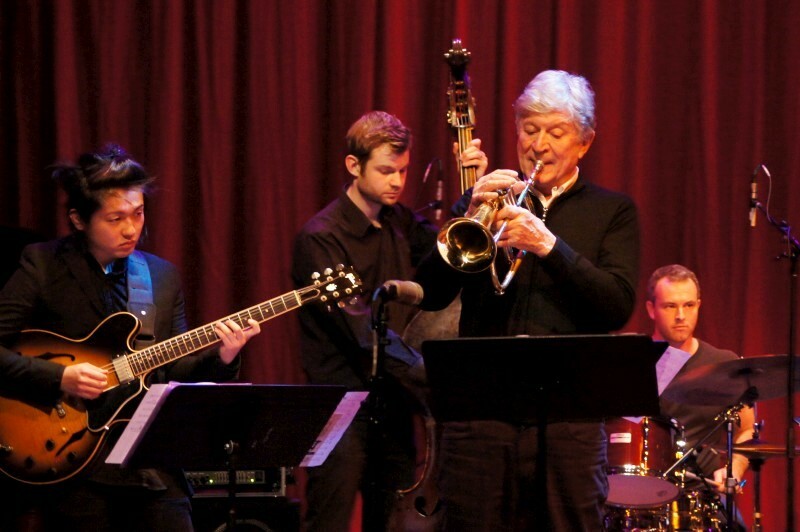 For Miro / For Woody: there's plenty of respect across the generations in jazz. Miro appeared for a few solos, including a New Orleans style duet with trombone, and I particularly enjoyed some solos on bari, alto, bass, guitar and drums. Plenty of decent players here, but the nature of a big band is communality rather than individualism, even if solos feature in virtually every tune. But it's community that makes the luscious tones and fascinating interactions and deep grooves. That's the beauty of the big band and this band has it. Much enjoyed. 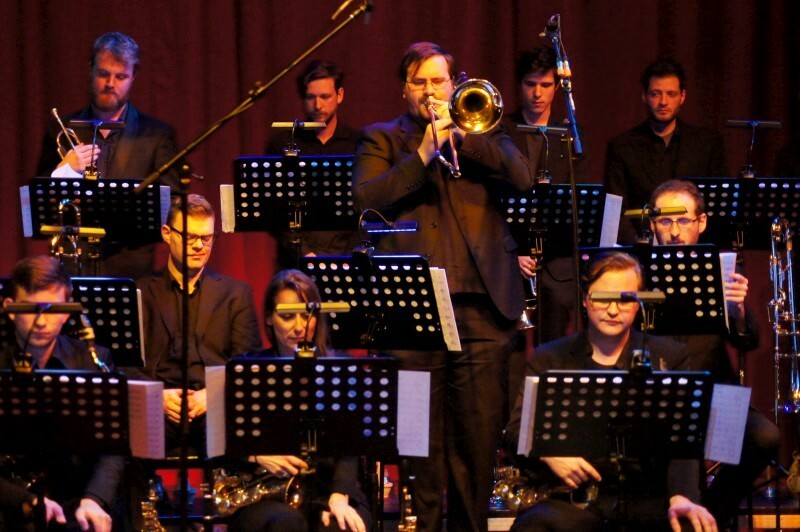 Jenna Cave (compositions, arrangements, director) led the Divergence Jazz Orchestra with Miroslav Bukovsky (trumpet, flugelhorn) as guest. DVO are Paul Weber (co-Musical Director), Brendan Champion, Tim Coggins (trombones), Luke Davis (bass trombone), Paul Murchison, Rob Campbell, Paul Meo, Will Gilbert, Will Endicott (trumpets, flugelhorns), Justin Buckingham (alto, soprano, flute), Loretta Palmiero (alto, clarinet), Evan Harris (tenor, soprano, flute), Louis Klassen (tenor), Tim Clarkson (baritone/clarinet), Luke Liang (guitar), Andrew Scott (piano), David Groves (bass) and James McCaffrey (drums). There are times when you are exposed to something of the highest quality and the expanse of an art or whatever becomes evident. 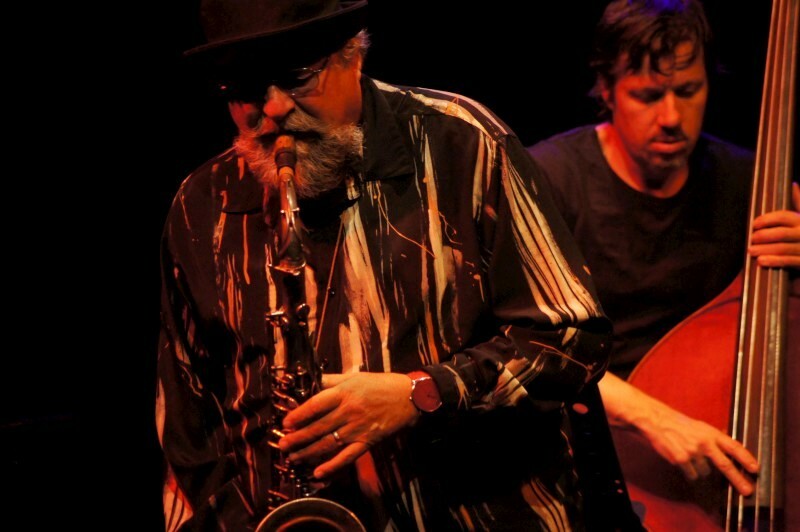 Joe Lovano played at the Street Theatre and this was listening to the heights of the improvisational jazz. Just a stunning outing and only enhanced by the intimate surroundings. This man plays his heart out. Two hours of just 6 tunes then a short take on Body and soul as an encore. They work hard, these types. They played some originals in the modern mould, Coltrane's Fifth house and Ornette' s Lonely woman and a few standards. We all know the standards, the cycles and the middle eight, but to hear the subtlety or the expansiveness and exhilaration of a master floored me. 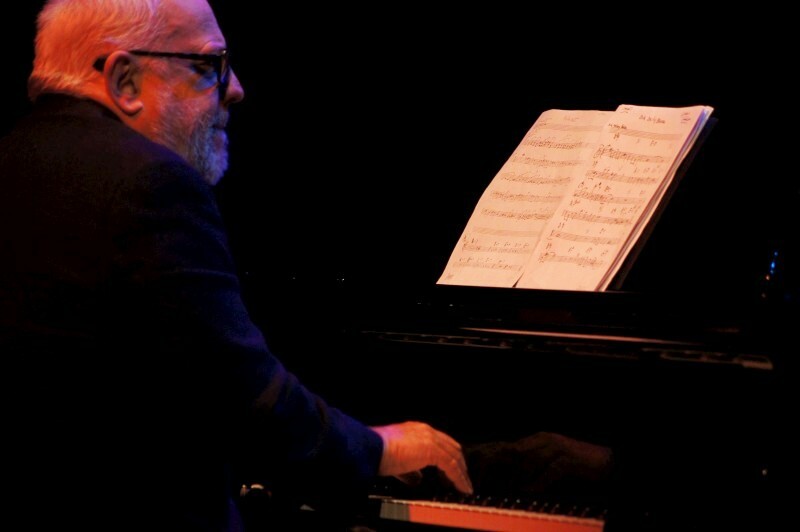 The support was Paul Grabowsky and his trio. All high energy, driving stuff. Paul with his Euro/classical influence, all fast with ideas, if to my ears not flowing with the earthiness of US black blues. Dave Beck driving, unrelenting, furious. Phil Rex, too, fast and furious but not without purpose. I loved his playing: sliding intervals, easy thumb positions, stunningly volley-fast with hammer-ons and open strings. 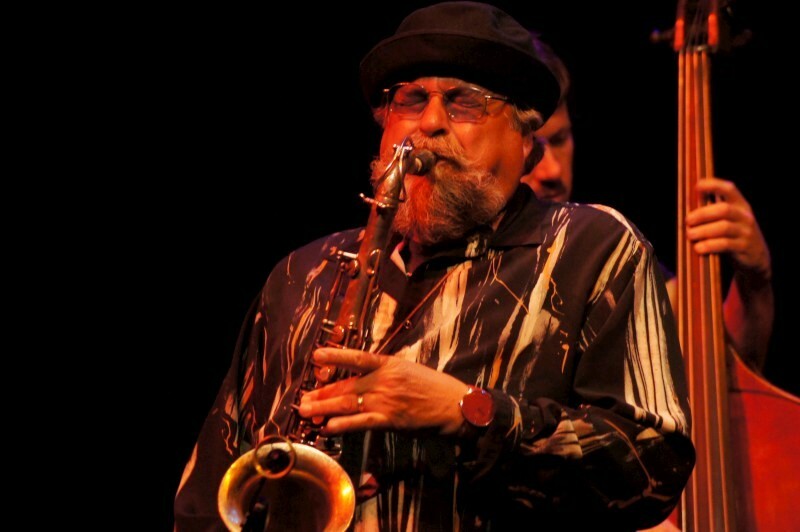 And Lovano, the huge presence, building ideas effectively or spewing forth lines. I noticed how wonderfully he could spell chords and create interest at speed, not with dissonance or substitutions but with intervals and merged notes as colour. Just masterful tenor playing. 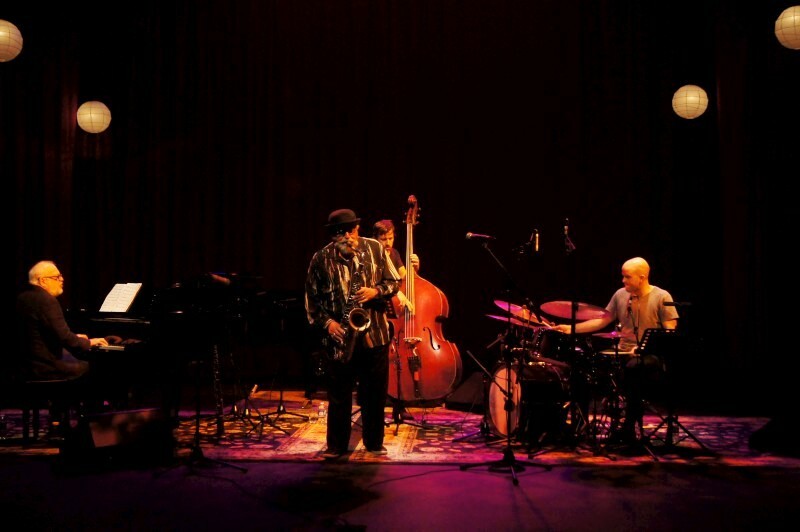 It's been a wonderful international line-up at CJP (Bad Plus, Eric Harland, Stefano Bollani, Ospina Brothers, Joe Lovano). Thanks to the Street for CJP, even if it has me musing on the dwindling smoke of Canberra. 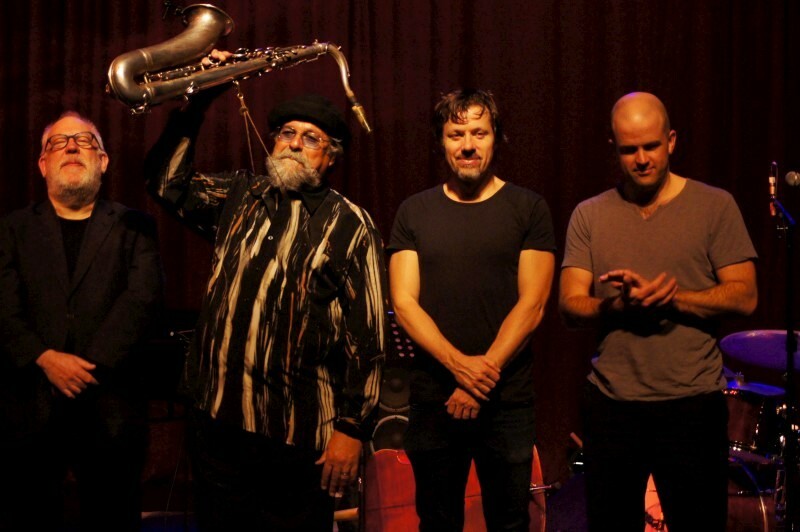 Joe Lovano (tenor, soprano) performed with Paul Grabowsky (piano), Phil Rex (bass) and Dave Beck (drums) for the Capital Jazz Project. 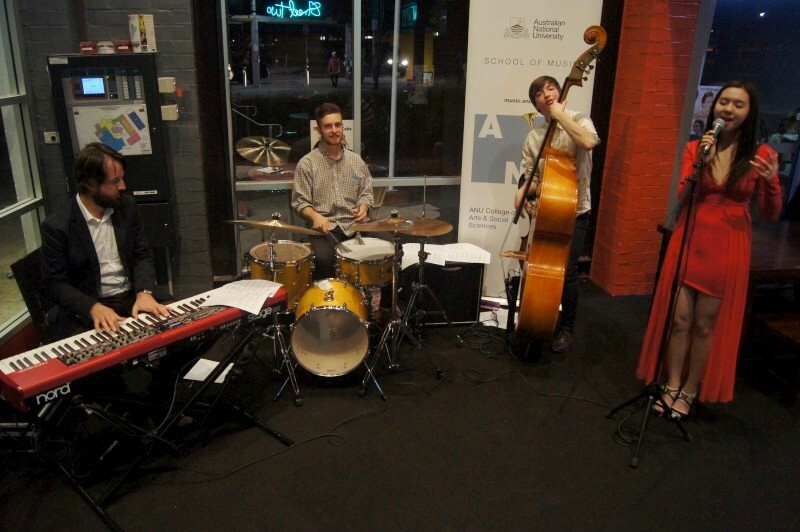 The foyer band was foyer band of ANU students: Caitlin Magee (vocals), Johannes Luebbers (piano), Brendan Keller-Tuberg (bass) and Alec Brinsmead (drums). 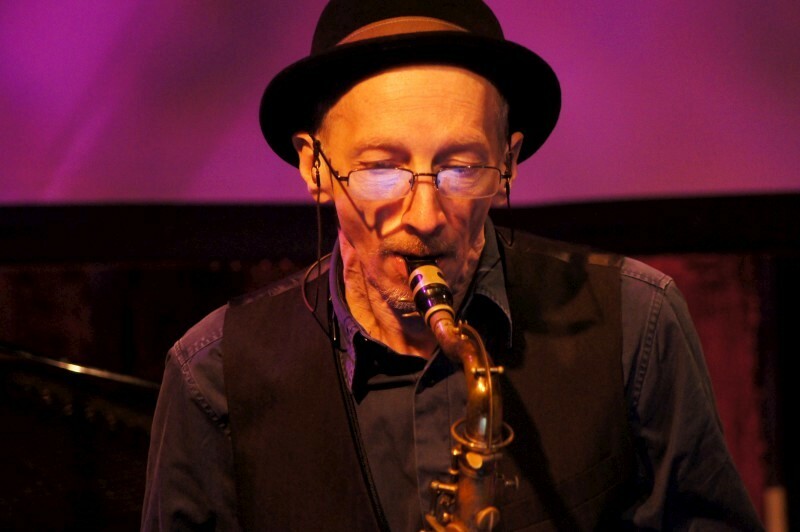 Mark Hannaford spoke highly of our Capital Jazz Project and remembered his time at the local School of Music and Miro's influence on his music. It felt at home in some ways. 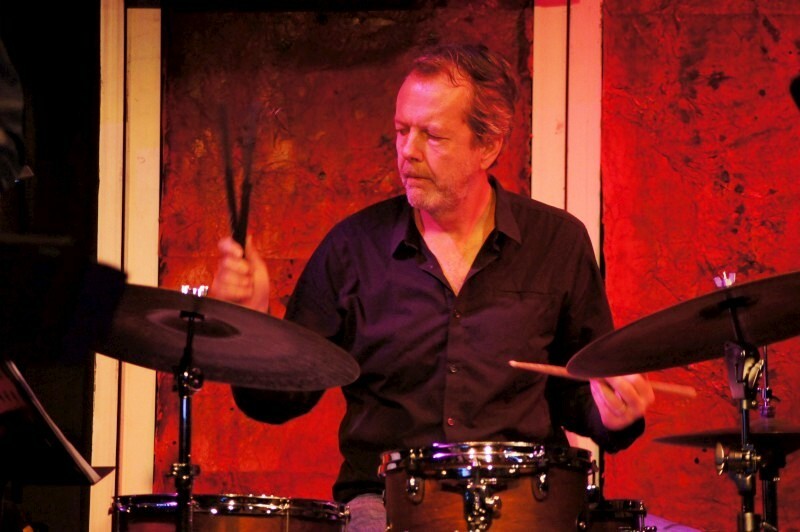 His insight at hearing Andrew Hill and Geri Allen and CJP as our little week of NYC buzz. 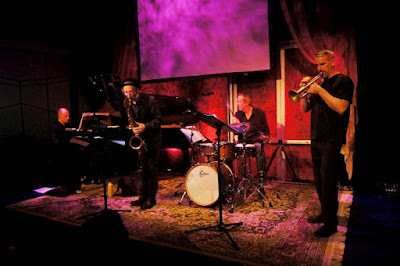 This concert, with Ellery Eskelin, Tom Rainey and Scott Tinkler, was certainly an unrelenting stunner and an exposure to something rarely heard locally. Intense, demanding, complicated and somewhat puzzling to my ear. The melodies, you could say heads, were clear enough if long and complicated, but I wondered how the music would otherwise be written. How are the underlying chords, if chords they are, interpreted? The obtuse response of the players was thrilling and wildly satisfying. Partly because I was so satisfied by the clear standard chops these guys had. Ellery's playing could spell harmonies with ease, so this was not just obtuse noise creation, but how were the relationships with others and tune established and played out? It had me thinking of Sonny Rollins alone on his bridge. This was of the highest creation. And Tom was all over, spelling out tunes in time but almost nothing settled. My thought here was Paul Motion, famous for his time, but again around the rhythm and the relationships rather than spelling time. Strangely it was a little more obvious when I moved to another seat on Mark's side of the stage. The accompaniment and some regularity became more obvious although still I wondered at it. How was this music written? There were solos passed fairly obviously and there were heads, all nicely organic, but both obvious enough, but the accompaniment and harmony was the challenge for me. Scott deserves his mention, too, of course, blowing immense lines and dropping delightful intervals to end. Firm and meteoric playing. This grouping has recorded and been recently travelling in Australia and talking of the music and this was their last gig. It showed with easy communication despite fairly blank faces. I'll be mulling over this for some time. It's got its connections with the mainstream but it's far freer and more inquiring. Masterful and too rare in this end of the woods. 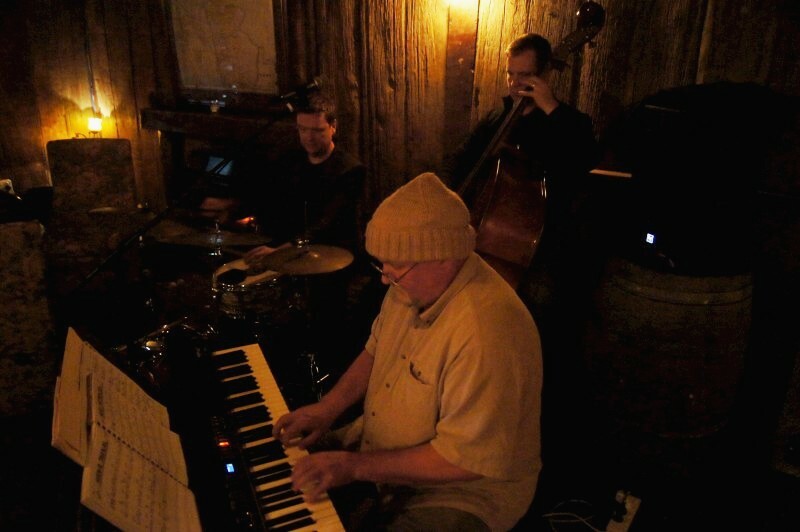 Mark Hannaford (piano, compositions) led a quartet with Ellery Eskelin (tenor), Scott Tinkler (trumpet) and Tom Rainey (drums) at Street Two for the Capital Jazz Project. 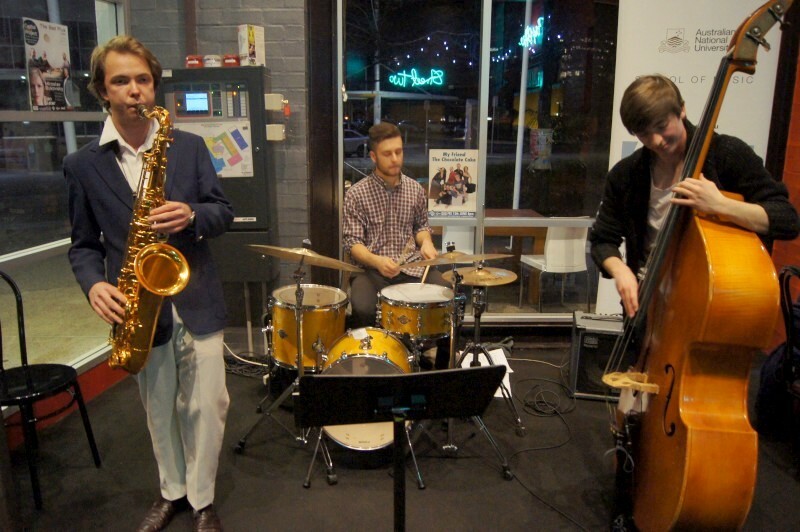 And thanks to the foyer band of ANU students: Andrej Thompson (tenor), Brendan Keller-Tuberg (bass) and Alec Brinsmead (drums).